Our guide to Ceiling Fans offers detailed descriptions of companies such as Littman Bros and The Modern Fan Company. Source of modern ceiling fans in contemporary finishes and simple geometric forms. Designers include Ron Rezek and Jorge Pensi. Manufacturer of designer interior and exterior ceiling fans and light kits. Styles range from traditional and vintage to mid-century and modern to industrial in a variety of materials. 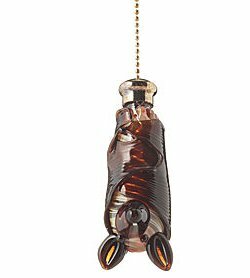 Full service lighting gallery in Illinois with vignettes to showcase popular and high end products and to offer design ideas to homeowners and custom builders. Also sells online. Innovators since the 1940s in "vortex action" fans - and today, a maker of stylish fans, heaters, humidifiers, air purifiers. Website offers direct sales of Vornado's products - and also offers a retailer locator. Hunter was founded as a ceiling fan maker way back in 1886. Today the company is still a leading maker of ceiling fans - and also offers a complete line of other home products include portable fans, air purifiers, thermostats, humidifiers, bathroom fans and zone heaters. Its website offers detailed info on each of its products - including user reviews and a dealer locator. Vintage Fans restores ceiling and desk fans made from the 1890s-1950s. Fans are fully functional after restoration. This online retailer sells factory-reconditioned Hunter fans, as well as brand-name food disposers, air cleaners, humidifiers and dehumidifiers. 3535 South Platte River Dr.
Tom Frampton began Fanimation in 1984 in his garage, with three ceiling fan designs. Twenty-five years later, the company is known for its unusual ceiling fans, including ones that are belt and pulley driven, units that rotate vertically, and units with real palm leaves. Since 1985, this retailers has offered landscape & outdoor lighting; indoor residential, commercial and industrial lighting; home automation products; sports and tennis court lighting; security lights; as well as lighting parts and accessories. Also: recessed lighting, under-cabinet lighting, dimmers and more. This decorative artist designs hand painted cabinet hardware, including handpainted cabinet knobs, ceiling fan pulls, light switchplate covers, lamp finials, wine bottle stoppers and Christmas ornaments. 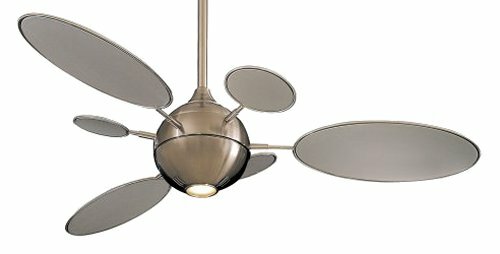 Sleek and silvery, a ceiling fan with a modern look.